Working with your spouse can be a good thing, a hard thing, a bad thing and a great thing. 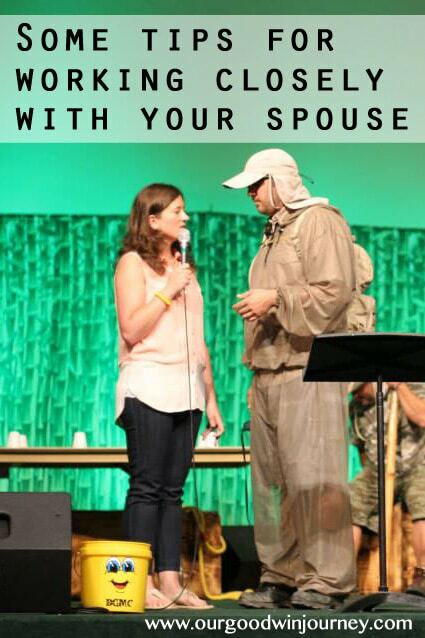 In this season of ministry, we’ve taken “working with your spouse” to a whole new level of crazy. 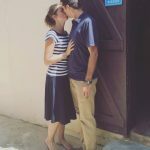 Being missionaries has brought togetherness to our family and our marriage. We have always worked closely together throughout our entire marriage. Being in ministry together as a couple has always been our goal. But this process of living overseas where he might be the only person I see today? Big time working with your spouse. We are together all the time. Other comments of “I don’t know what I’d do if my husband didn’t go to work during the day.” and “Thank goodness I can go to work a few days!” are common when I share with people our close working relationship. The truth for us is that we sleep together, eat together, work together, preach together, shop together, parent together, run together… our lives are literally being lived in tandem. Well, we’ve learned a few things through some not so smooth days. We’ve worked through many bumps in the road to learn how to work peacefully together. 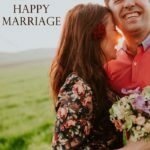 Here are a few things we’ve learned… in case you ever find yourself closely working with your spouse. 1. Don’t push buttons. You know the buttons in your marriage. Don’t push them. 2. Create space. Even when you are working together on a project or event, you need to create some space so you have moments to recharge. 3. Keep fun things in the schedule. Remember that you are married! You can go on a date with your coworker. You can take a break from work for a run to Speedway for free flavored water. Don’t forget to have fun together. All work and no play will not foster success in a close working marriage. Date Night must still happen. 4. Respect opinions. Working with your spouse can make you all too opinionated and passionate about your own point of view. You will say things and do things you wouldn’t normally get away with in a different working relationship. Be respectful. Keep words cautious. Listen. Communicate well. 5. Make lists. You both might not work at the same time even though you are working on the same things. Make lists for each of you to accomplish on your own time. And don’t nag. Use an app that allows you to sync these lists on your phones. We use any.do app. 6. Have staff meetings. Go for coffee or sit at the kitchen table. Go over the calendar or phone call notes or whatever you’ve worked on separately. This keeps you both on the same page. Read this post from The Art of Manliness. 7. Use technology! Technology is a huge blessing to our marriage. We text through the day, even in the same house. We send each other funny articles or memes. We watch comedy shows on facebook. We laugh through groups chats with family members. Technology can be a lot of fun in marriage… with boundaries, of course! 8. Don’t forget to take care of your marriage even though things are busy! Here are some tips for keeping marriage hot in the busy times. 9. Truly love what you do. Be sure you love what you do. And if you don’t? Pray that God will give you a love for what you are doing with your spouse. Ask God each day for a new heart, a new love, a new grace for the season you are in. 10. Step away. Don’t be afraid to turn everything off, shut work down, put up the closed sign, and step away from all things work. Have time to just be together or with friends without it being work related. We are really blessed to have this time together as a couple. We’ve learned so much about ourselves and about each other. You might find yourself in a season where your husband is home more either from a job change or a transition of some kind. You might find yourself spending lots of time together. Don’t be shocked that it’s hard. 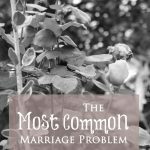 Don’t be worried if you are frustrated with your spouse and need some time away. Don’t be discouraged if you have some rough days. Keep at it. Work hard. Get to know your spouse on a deeper level and see the time of closeness as a gift from God. Challenge yourselves to grow in your relationship and make steps to work closely together in peace. 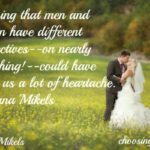 Have you ever worked with your spouse or found yourselves in a season of constant togetherness? Thank you for your articles! After being married for 23 years we are just now being integrated into a mission field and there is a lot of craziness that no one really warned either of us about which adds stress to our marriage, which never really happened before! We were told about cross cultural awareness but those were just words. Your blog will be our go to article, we already have the go to book (Bible) so when we freak out or things are not making sense, again, I will definitely come back and visit often! Thank You for sharing your insight and experience!! a lot of craziness for sure! I’m so glad the blog can be a help to you. 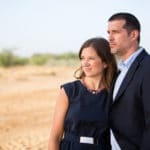 Marriage and Missions are difficult but rewarding in their blending. Thanks for stopping by! What a great article with excellent reminders!! 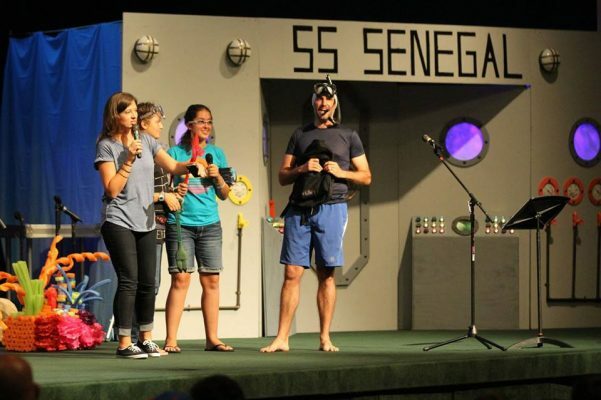 My serious boyfriend and I are in camp ministry– both living, working, and dating at camp! Some days can be so frustrating but we see the growth God is putting us through and the patience he is teaching us! We don’t know if marriage will hold full-time ministry, but it’s good to see we are not alone! I love where you say love what you do or ask God to help you love what you do. I think that is so important. I think a lot of times when we are called to do something for God we don’t necessarily love it but do it out of obedience to God. That’s when talking to God is so important. Pray and ask him to help you enjoy the things He has called you to do in your life. Great stuff you have here! I have worked with my husband for the last 11 years. We are in the business of long term care for the elderly. We know what it’s like to work shoulder to shoulder with each other. obedience and prayer is so important! Thank you for sharing your story! Thanks for the article. Very few people know what it is like to truly work with your spouse every day. My husband and I have worked together for 5 years. We own two daycare homes. Lots of work raising our four kids, taking care of 28 other kids and managing our business. It is so worth it to both be raising our kids together. Neither of us misses any of those precious moments. I would add to really remember the things you love personally and work to cultivate them. 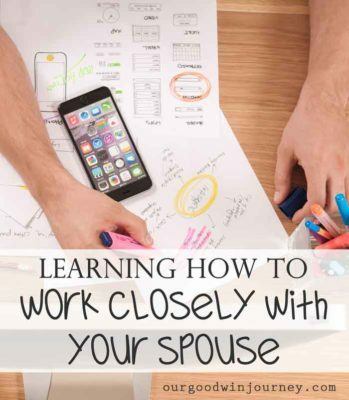 When you need to vent about work let your husband know that is what you want to do, remember he is personally attached to your job as well (easy to become defensive). Never miss date night! Start and end every day with a kiss. Meet for “lunch dates :-)” Lastly remember work is work and your marriage is way more important than any temporal job. I loved reading your story!! Thanks for sharing your experience and your tips! We love lunch dates. 🙂 and remembering our marriage is important. yes. These are most excellent tips and advice! My husband and I went through a season (too short in my opinion) that he was home most of the day during a time of a down time of work. People would ask me the same questions you got asked. Sadly, one of those people was a mentor of mine (and her husband was one of my husband’s mentors)…hence the word “was”. I LOVED being around my husband like that! I got to know him better and more intimately. 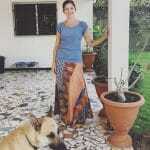 At that time of transition, we were living in a 700 sq. ft. millhouse (2 bedrooms and 1 bath…for 8 people)!! It was a time that we were growing in our faith together, clinging to the Word together, lengthy conversations about what God was doing in our lives and business. It was a time that was the most simplistic! I will also say though that giving each other some space IS VITAL! I’m an introvert and don’t need much attention at all. My husband, on the other hand, is extrovert and very “touchy-feely”. There were times that I’d have to ask for a few hours retreat to not have someone (him or the kids) touching on me!! haha! It’s refreshing to see couples that get each other and know the value in their time together! Great tips Jenilee! My Jeremy and I work closely in everything except his secular job of course. But our dream and vision is to one day be full time in ministry. While these tips are great for now, I know they will also help us as we grow to that point. Thanks! I’m glad they are a help! Can’t wait to see what God does in you both! Words of wisdom learned the hard way I imagine, but lessons learned hard are lessons learned best! yes, it does take some work but we have learned to really LOVE working together!